Properties are considered to be in Preforeclosure from the filing of the initial Notice of Default until the property is sold at auction. During this period investors can purchase the home directly from the owner, Realtors can list the home, and Lenders can help them refinance. Note that prior to the filing of the Notice of Default the home is considered to be “Delinquent” rather than in Preforeclosure, despite that period of time also being before the foreclosure sale. Bank owned properties received no bid at auction, resulting in the bank taking ownership. 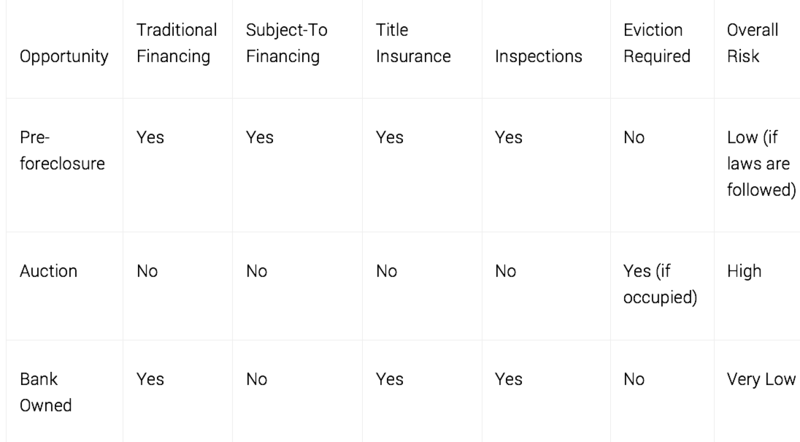 These properties are commonly referred to by the banks as REO’s (Real Estate Owned). Investors can purchase these properties directly from the bank; and Realtors® can solicit the listing, since banks will almost certainly market the property for sale.